Just as Noctis has had to wait many years to reunite with Luna, we too have had to wait many years for the release of the long awaited Final Fantasy XV. 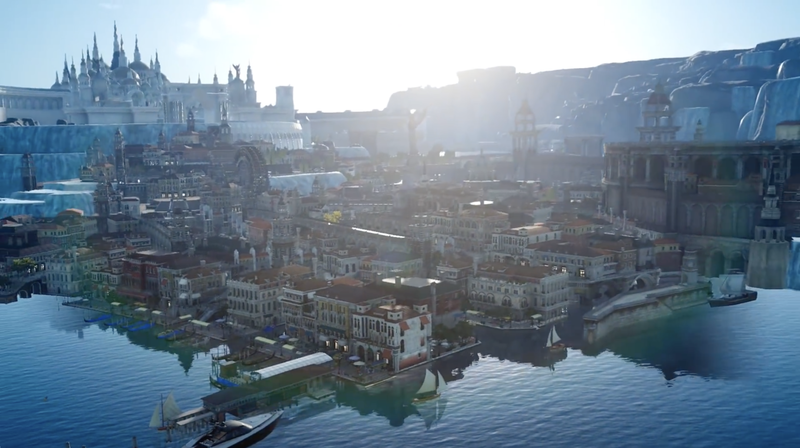 Though a lot has changed (like its title, since it was previously marketed as Final Fantasy Versus XIII), I can’t say I’m disappointed. Since Tuesday, I’ve been playing the game non-stop. Here are just a few reasons why I can’t put it down. I can’t help but smile every time one of these guys strikes up a casual conversation or saves each other from battle. From the start of the game, you realize that these crazy kids would die for one another (quite literally). They definitely have an unshakable bond. 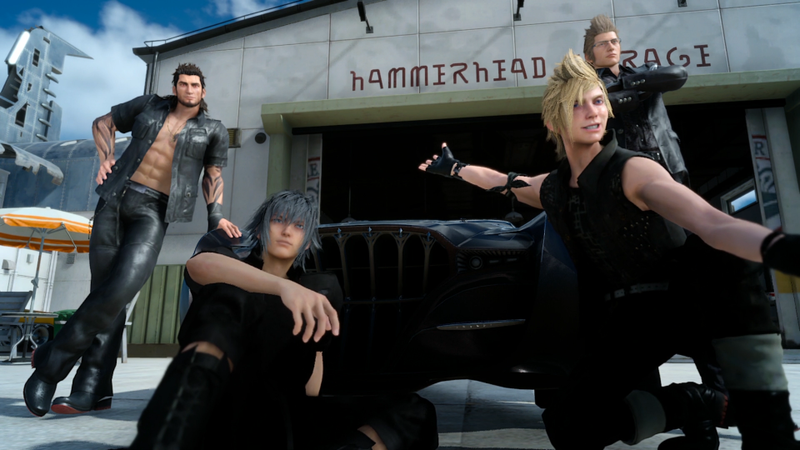 The group is well-rounded and everyone is important to Noctis in various ways: Gladio is definitely a father figure; Ignis is the mommy of the group; and Promto can't help but be the little brother. Their friendship is extremely important, and they never fail to support one another. I mean, when the game's theme song is Stand By Me, friendship HAS to an important aspect. *starts sobbing uncontrollably* It’s so darn beautiful, both graphically and musically. Square Enix has always excelled in aesthetically pleasing the player, but man is this game drop dead gorgeous. You can tell they put their heart and soul into every detail. When it rains, the characters' hair flattens, when they're running around all day, they get dirty and gross (and even comment on it). The transitions from cut scenes to gameplay is so seamless you'll constantly wonder if it's time to play or time to watch. The music is magical too. I mean, it’s Yoko Shimomura (same composer for the Kingdom Hearts soundtrack), so it's no wonder every song moves the player. Each track captures the moment you’re in and fully immerses you in the world. Even the first piece of music we hear during the menu screen is telling, hinting at sadness and a glimmer of hope. In game, the battle music has so much badassery to it, it should be criminal. Beyond that, themes for places and people are just as breathtaking. 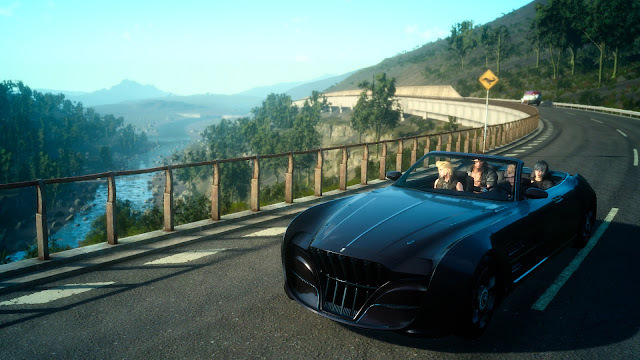 It's also an added bonus that the player is able to listen to the game's soundtrack (plus other Final Fantasy music) while cruising in the car. Wow. Just...wow. There's so much I want to say about the battle system. Warping alone is fantastically fun and addicting (watch your MP! ), but there are countless things to say about the gameplay. I won't have room to touch on all of it, but I will mention a few things. There is a tremendous amount of customization. You can even customize what you're wearing, which alters your HP, strength, and more. Then there is magic, of course, but the magic actually affects your surroundings! If you throw a thunder spell out and you're standing too close, expect to get electrocuted (then see burn marks on your clothes afterwards). The weapons are astounding too!! Some of the most powerful ones have a catch to them and end up depleting your health but deal heavy damage to opponents. You can even call your friends to aid you in a fight, and either one or all will jump in and complete a cinematic fight scene with Noctis. There's so much to the battle system and I won't get too much into it, but if you play the game, you'll find out for yourself. There are so many hobbies you can have fun with! 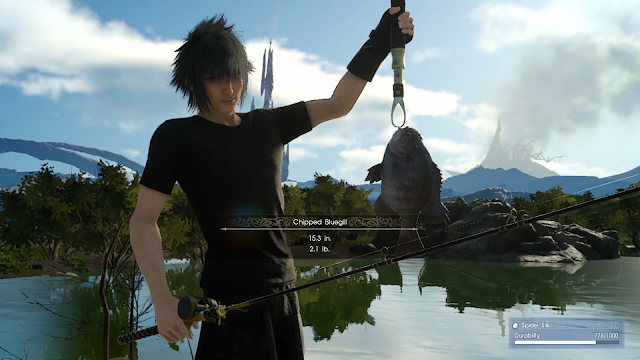 Noctis loves fishing, so as the player, you're able to participate in (basically) a mini game to catch fish for either eating or rewards. Promoto is the photographer of the group and captures bro moments that you can post on social media. Gladio sets up camp, which the party can then use to rest in order to level up and eat. And Ignis enjoys cooking, which gives your characters certain attributes or boosts depending on the ingredients and recipes. 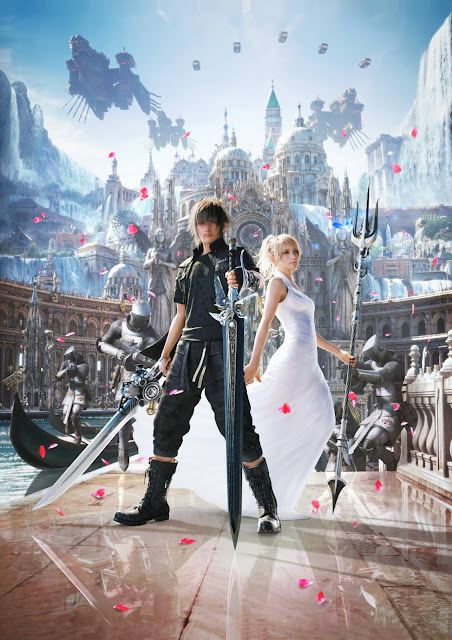 Final Fantasy XV follows Prince Noctis on his quest to find his fiancée Lady Lunafreya so that together they can save the kingdom from the Empire. On his journey, Noct is accompanied by his best friends and guardians Gladiolus, Promto, and Ignis. The story that this Final Fantasy has to tell is extensive. 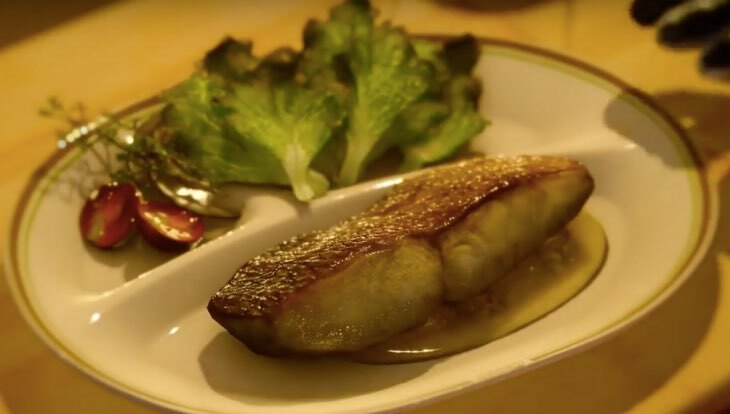 In fact, besides the main game, there are a multitude of stories on various media that accompany it, from an anime to a feature length movie to even a side scrolling retro game. Bonus: The Chocobos. Just look at 'em!!! So cute. Though I still have quite a ways before I beat the game, I’m looking forward to seeing more from Noct & company and the world of Eos. 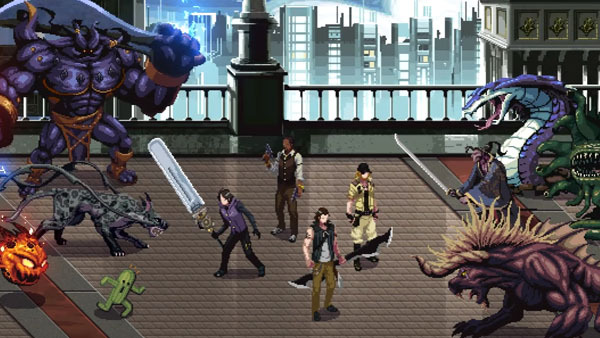 Congrats, Final Fantasy, you’ve overcome the odds once again. Here's to fifteen more installments. 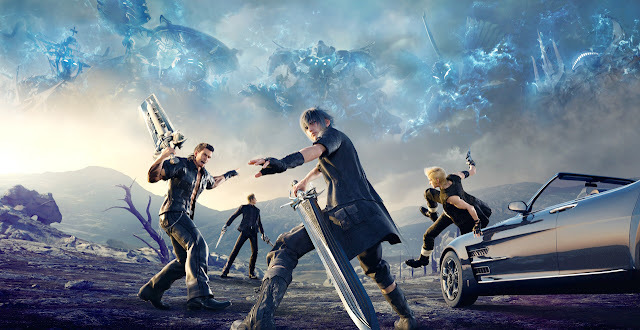 Have you played Final Fantasy XV?